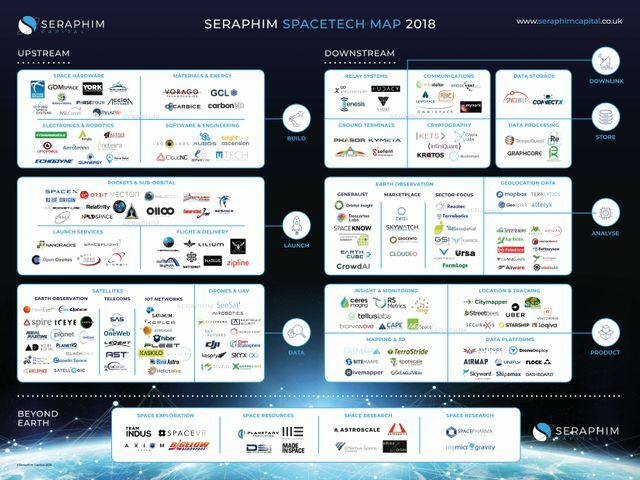 Together with my colleagues at Seraphim, we’ve compiled a new market map of the SpaceTech ecosystem – one designed to more fully capture the breadth of innovation happening right across the industry. We felt it was important to demonstrate that the eye-catching, ‘upstream’ parts of the ecosystem that people naturally focus on – such as rocket launchers and satellite constellations - are actually just the tip of the iceberg when compared against the amazing levels of innovation occurring ‘below the waterline’ right across the SpaceTech value chain. It is with such enabling technologies that underpin the broader ecosystem that we at Seraphim believe hold the promise of transformational growth. As the world’s only SpaceTech themed venture fund, we are in a privileged position of having a panoptic view of much of the innovation that is happening within the SpaceTech ecosystem. We therefore wanted to ‘pay it forward’ by collating the 1,500+ companies we’ve identified over the last 18 months into a detailed market map to help inform those from the wider Space and investment communities about how rich this developing ecosystem really is. You can find the full market map here. At Seraphim, we are aiming to try to identify and invest in the emerging category-defining companies in each section of our market map. We believe we are still in the early phases of a multi-decade journey that promises to transform both the Space sector and the huge array of industries that rely upon it. We are excited to see how with the support of ourselves and others the SpaceTech ecosystem will continue to thrive and evolve. The breadth and depth of innovation that’s happening within the SpaceTech ecosystem is far richer than many people realise, is happening across all segments of the market, and on a truly global basis.